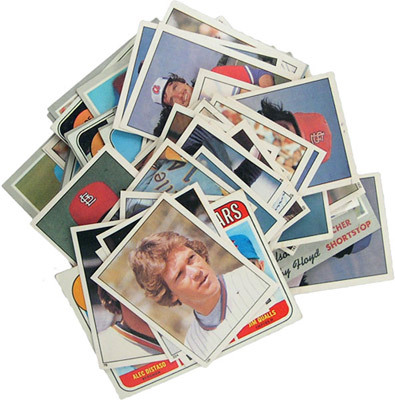 Group of Baseball Cards & Stickers, 1960s-1980s. Printed paper, 3" to 3 1/2" high, USA. The Act of Collecting takes a broad look at objects and prototypical collectors, who fall into three precise categories. Silas Marner exemplifies those who collect goods of intrinsic value (ex: gold, gems), universally coveted substances that have been desirable through the ages. Lorenzo De’Medici represents those who collect commodities of extrinsic value (ex: art, stamps, baseball cards, comic books) with a competing collectorship and limited availability. Tom Sawyer typifies those who collect items without intrinsic or extrinsic value (ex: a thread spool, a blue glass shard, an orphaned key), which convey satisfaction and confer serenity upon the collectors who accumulate them. These objects and their ilk (ex: cigar rings, do not disturb signs and air sickness bags) are devalued, undervalued or simply not valued beyond their limited functionality by most people. Collections of the discarded, the unloved, inspire and fulfill those who have dominion over them.